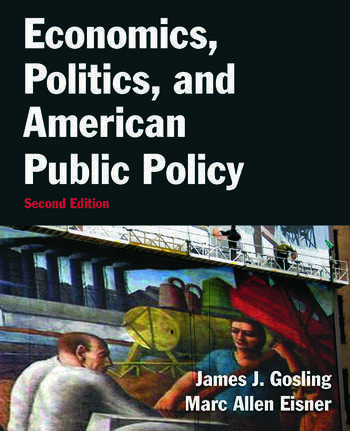 This text introduces students to the interrelationship of politics and economics in American public policymaking: how economic concerns have been legislated into law since Franklin Roosevelt's time and how politics (e.g., Washington gridlock) affects the economy and the making of public policy. Students learn how to measure various indicators of economic performance, how the U.S. economy works (domestically and with international linkages), and how and why policymakers act to stabilise an economy in an economic downturn. Additionally, many social insurance programs (Social Security, Medicare, Medicaid) are explained and the current fiscal issues concerning current/future costs are treated in some detail. The book concludes with a full chapter case study on the Obama administration's response to the Great Recession and its dealings with Congress; the implementation of the Affordable Care Act is also discussed. James J. Gosling has taught at the University of Wisconsin-Madison and the University of Utah. His recent books include Politics and Policy in American States and Communities (with Dennis L. Dresang), eighth edition (Pearson Longman, 2013); Budgetary Politics in American Governments, fifth edition (Routledge, 2009); and Understanding, Informing, and Appraising Public Policy (Pearson Longman, 2004). Marc Allen Eisner is the Henry Merritt Wriston Chair of Public Policy and Professor of Government and Environmental Studies at Wesleyan University. Eisner is author or coauthor of several books on political economy and regulation. His recent books include The American Political Economy (Routledge, 2011), Governing the Environment (Rienner, 2007), and Regulatory Politics in Transition, second edition (Johns Hopkins, 2000).